Since we were first asked to install a canopy made up of random loops of festoon lights, the design has really caught on! 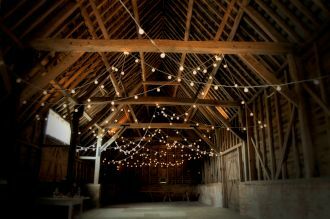 On this occasion we installed an enormous number of lights for a wedding in the fantastic, rustic barn at North Hidden Farm in Berkshire. By its very nature the festoon random loops canopy is different every time. Installing it needs a blend of art and science to fill the space evenly while making it visually interesting and unstructured. This barn is quite long and has lots of beams and other points to attach the lights to, so we were able to come up with a really fun layout with lots of variation, making full use of the different heights available. The final result was a perfect match for the rustic style of this beautiful barn wedding. We have a page dedicated to lighting at North Hidden Farm here and we can be contacted here to discuss lighting ideas for your wedding in this fantastic venue. I just wanted to drop a note to say thank you SO much for the amazing lighting you created for us at our wedding at North Hidden Barn. They were just gorgeous and created the most amazing atmosphere. Everyone commented on them and we've passed your name on to lots of interested parties!